Simply add your branding and resell it as your own. Kastio makes creating interactive webcasts a snap. Kastio makes it easy to setup and style registration and watch pages and incorporate your clients branding. Change colors, images and text without writing a single line of code, and show or hide only the widgets your want the viewers to see. Your clients only see your branding and URL's on the platform pages. They'll think you built your very own webcasting platform. All pages and players scale automatically to fit any browser and device and there are no plugin downloads required. When your event is closed, viewers will see your pre-show image with a countdown. This let's you test your live event in background. Once you're ready to go live simply open the event and your viewers will see your live stream. 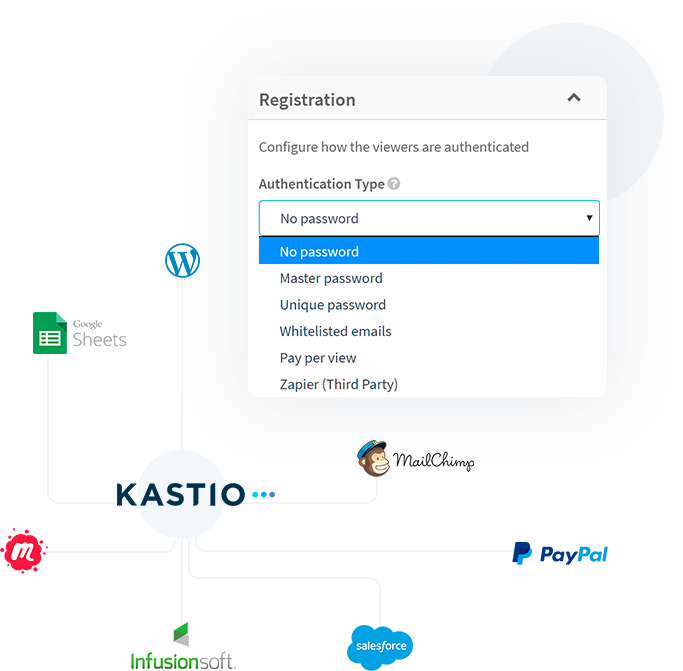 With Kastio you can control access to your webcasts either through open registration or through secure password protection. 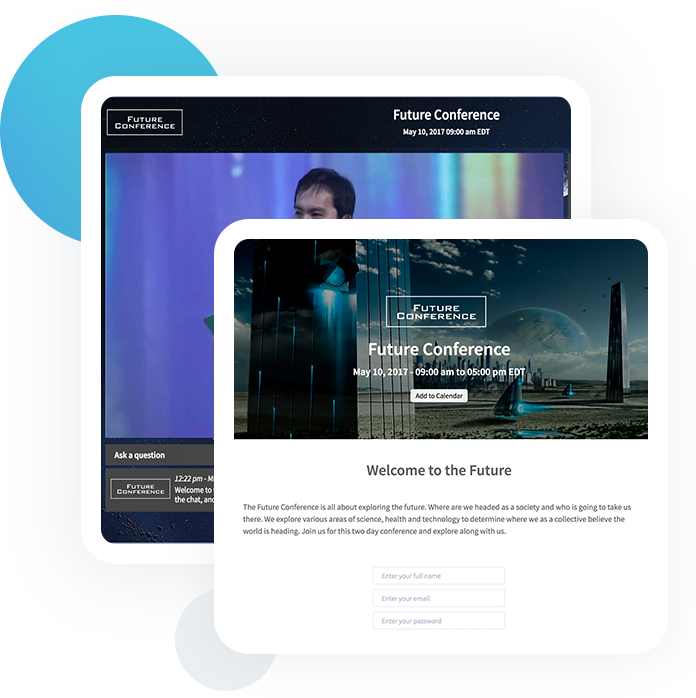 Let users access your event with a simple button click, or require multi-field data collection. You can even embed the registration form on any website you like. 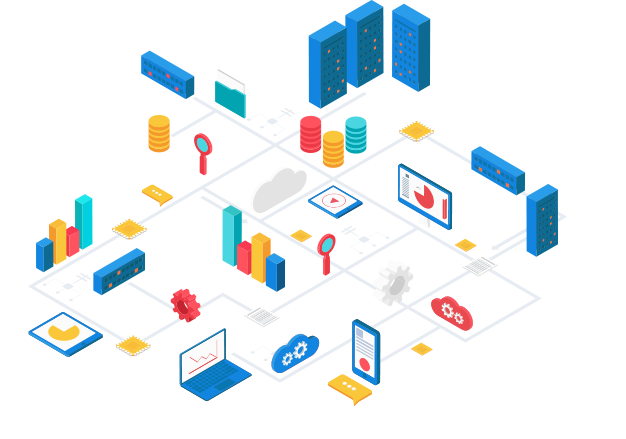 Choose from one of six built in access types including unique passwords, email whitelisting, pay-per-view and geoblock out any territories you like. Kastio connects to Zapier which allows you to connect to any registration system that has an API such as Eventbrite or Wordpress. Hosting an event with multiple breakout rooms? Viewers can easily switch between each room, while backend control for each room remains separate. Your live control room shows your production team everything they need to run the live event from a single screen. Track all the important stats in realtime including viewing watching now, peak viewers, and retention rate. Invite technical team members and client moderators under different permissions structures. 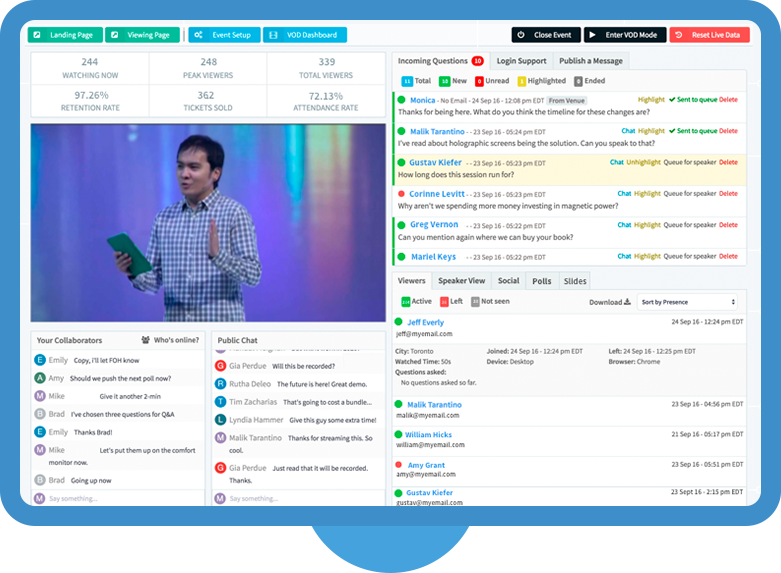 Kastio includes a complete suite of tools for interacting and engaging your audience. With Kastio’s build in CDN, simply send us a single RTMP feed from your encoder and we'll deliver a multi-bitrate stream to the customizable video player. It works across browsers and devices with nothing for your viewers to install. With Kastio you can record your live stream right inside the dashboard. Choose when to start and stop recording and easily download an mp4 after the recording is finished. Recordings can be made available for viewing after your event finishes. You can choose with ones to show and hide to your viewers, and they can be accessed using the same registration and authorization settings used for live. 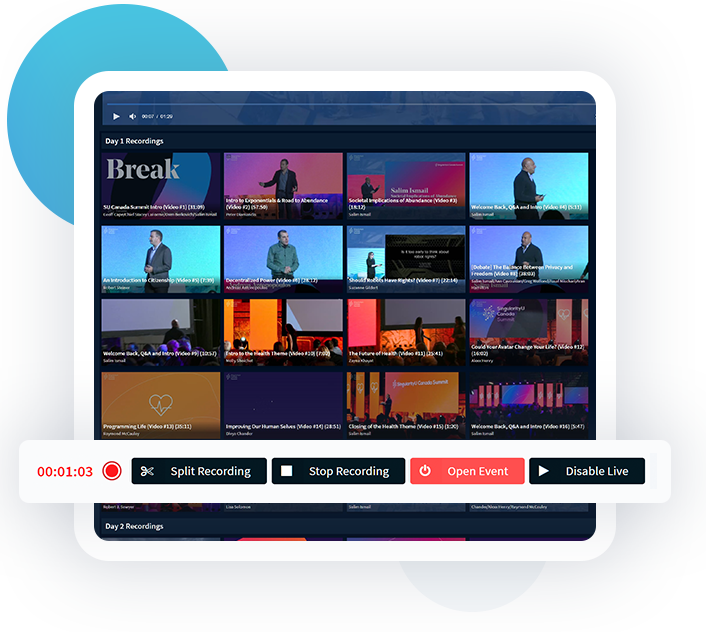 While recording your live streams, you can split up your recordings into content sections and them trim the head and tail of each clip for playback. This can eliminate the need to editing and uploading after to save you time. Add section headers and categorize your clips into groups for a full organized VOD page. You can also include clips from third party video sites like YouTube, Vimeo and Wistia to complete your archive. Kastio can send your attendees automated transnational emails that are full editable and can be customized with your clients branding and your company details. Sent to everyone as soon as they register with a private link that gives them instant access to the event from their email. Sent at various times before your event begins to remind attendees when your event is starting. This includes the option to send an email when you open your event alerting everything that your event is about to start. Sent after your event ends, post event emails can be segmented between those that attended and those who didn’t. Post event emails can also be used to drive action such as filling out a survey. With Kastio, those attendees in the room are not left out. In-room attendees receive a suite of features that they can access from their phone, laptop or tablet through a short link. Receive a video feed which is great for sending PowerPoint slides or supplemental video or audio streams to their device such as live translation. As a professional webcasting service provider we were considering building our own webcasting platform to better serve our clients. Before jumping in, we were evaluating some of the newer webcasting platforms on the market. It was in this evaluation period that we found Kastio. All we can say is 'wow'. They've built everything we need (and more) in their platform and it's a fraction of the cost to us building our own. Now we're running our biggest webcasts on Kastio and loving every minute of it. Kastio's platform gives me the ability to produce interactive webcasts with enterprise-grade features. The platform lets me deliver on my clients' expectations for a fraction of the cost of previous previous providers. Great work, Eventstream! Kastio's integration to our e-commerce system enabled us to seamlessly sell seats to our webcast. Their execution of the webcast during the event was flawless, garnering a 9.5 out of 10 rating from an audience. Add event days as needed. No minimum. Setup fee is paid once when your account is onboarded to help you get up and running and your website DNS configured. Rooms are defined a single streaming location. For example a main & breakout room would be considered two rooms. Room size is determined by max simultaneous participants. Plans scale from 100 to 100,000 viewers. Registrations are unlimited. All plans include all features, phone and email support.